In tightly covered container, shake vinaigrette ingredients. Divide salad greens among 6 plates. Top each with pears, peanuts and raisins. Drizzle with vinaigrette. Serve immediately. 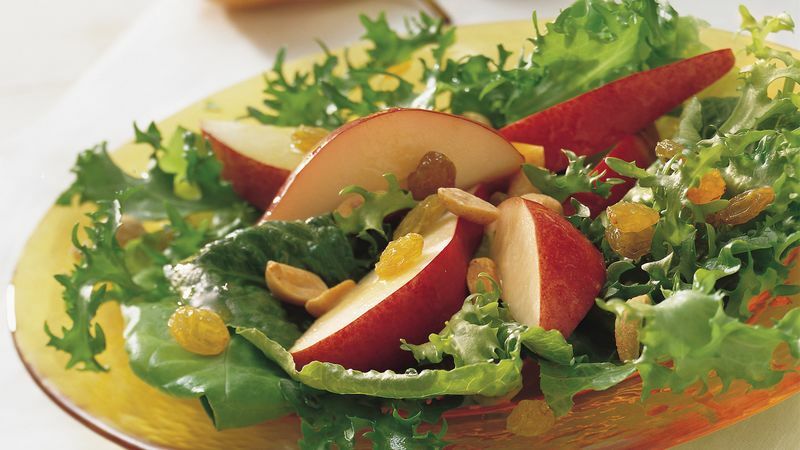 A sweet variety of eating apple can be substituted for the pears, and regular raisins or sweetened dried cranberries can be used instead of golden raisins. Unlike most fruit, pears improve in flavor and texture after being harvested. If the pears you find in the supermarket are hard, store them in a plastic or paper bag at room temperature until they give slightly when pressed lightly. Once ripened, store pears in the refrigerator.